At the beginning of his turn, Dong Tu Na can give any number of cards to any player. If he gives someone two or more, they must attack another player one distance away or lose one health. Once per turn, he can use any diamond as a break. 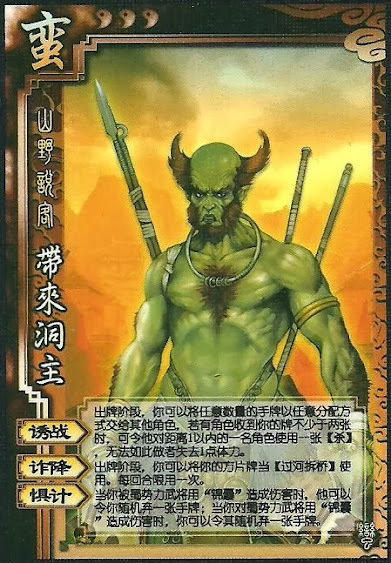 When Dai Lai Dong Zhu is damaged by a tool played by someone from Shu, he can discard a card from them. When he damages any member of Shu with a tool, they can discard a card from him. "Lure to War" begins the same way as Liu Bei's "Kindness". If someone gets two or more cards, it turns into Jia Xu's "Upheaval". When Dai Lai Dong Zhu uses "Sneaky Fall", he can use a hand or an equipped card. "Measure of Fear" works the same in both directions between Dai Lai Dong Zhu and any member of Shu, but only damage from a tool card will activate it.